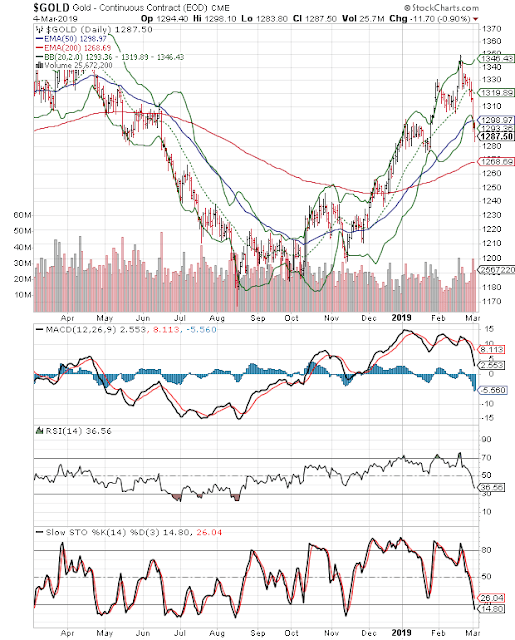 The daily bar chart pattern of Gold received good support from the middle Bollinger Band (20 day SMA, marked by green dotted line) and rose quickly to touch a high of 1349.80 on Feb 20. By closing above the upper Bollinger Band, the door was left wide open for bears. Gold’s price corrected sharply below the lower Bollinger Band and closed below its 50 day EMA after more than three months. Daily technical indicators are showing downward momentum after correcting overbought conditions. MACD is falling below its signal line in bullish zone. RSI has dropped below its 50% level. Slow stochastic has entered its oversold zone, and can trigger a pullback towards the 50 day EMA. After a sharp fall below 96 on Feb 26, the US Dollar index is rising towards 97. That seems to have dampened bullish enthusiasm. The strong rally from the Nov ’18 low has ended. On longer term weekly chart (not shown), gold’s price dropped to seek support from its 20 week EMA, and closed above its three weekly EMAs in long-term bull territory for the tenth week in a row. The ‘golden cross’ of the 50 week EMA above the 200 week EMA has technically confirmed a return to a long-term bull market. Weekly technical indicators have corrected overbought conditions but are showing downward momentum in bullish zones. The daily bar chart pattern of Silver bounced up after receiving good support from its 50 day EMA and rose to test its previous (Jan 31) top of 16.29, but failed to close above it. 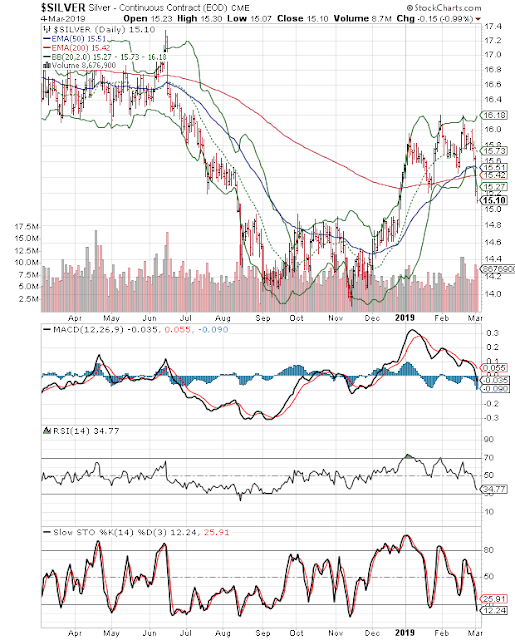 Silver’s price pierced the upper Bollinger Band and formed a ‘double top’ reversal pattern. A sharp correction below the lower Bollinger Band and the 200 day EMA followed. Daily technical indicators are looking bearish. MACD is falling below its signal line and has entered bearish zone. RSI is falling towards its oversold zone. Slow stochastic has entered its oversold zone, and can trigger a pullback towards the 200 day EMA. On longer term weekly chart (not shown), silver’s price closed below its three weekly EMAs in a long-term bear market. Weekly technical indicators are showing downward momentum. MACD and Slow stochastic are in bullish zones. RSI has fallen below its 50% level.